Tasting like a mild version of an extremely tender chicken, a Cornish game hen isn't really a game animal at all. In fact, the bird is a hybrid breed, a mix between Cornish chickens and white rock chickens. 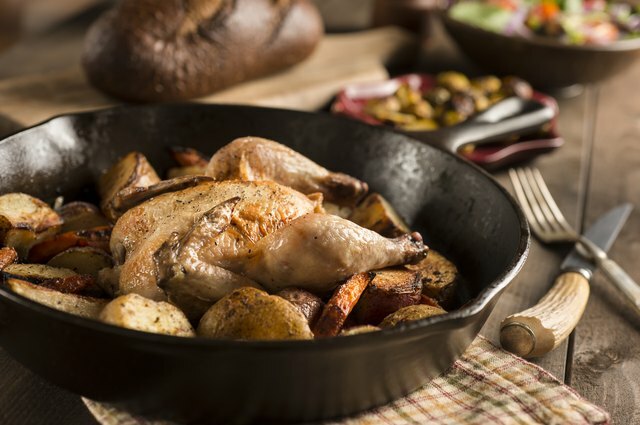 But no matter what its heritage, Cornish game hens make an impression at the dinner table because everyone typically has a perfect, little bird all to themselves. Whether you roast your Cornish game hens stuffed or unstuffed, the only way to really know if they're done is to check the meat with a meat thermometer. 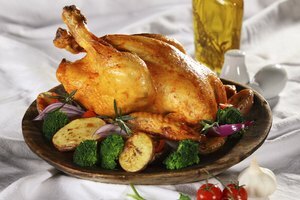 The U.S. Department of Agriculture recommends that you cook any poultry, including Cornish game hens, to 165 degrees Fahrenheit. Insert a regular meat thermometer deep into the thigh of the hen before placing it in the oven, making sure the probe isn't touching bone. If you have an instant-read thermometer, check the hen about 5 minutes before the end of your anticipated cooking time. When the temp reaches its mark, remove the hen from the oven, cover it with foil and let it rest for another 10 minutes. Remove the skin before serving to reduce the amount of calories and fat. 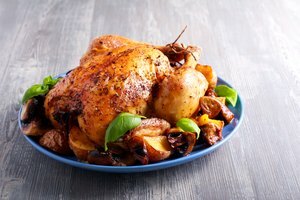 If you have the best roast chicken recipe around, simply use that recipe for roasting Cornish game hens, but know that the birds will be done much more quickly than chicken. In a 350-degree oven, the birds will be done in 50 to 60 minutes. If you prefer an extra crispy skin, roast the birds in the oven at 425 degrees. They should be done in about 45 minutes. Stuffed Cornish game hens take a bit longer to cook than unstuffed birds, from 65 to 90 minutes in a 350-degree oven. Always follow safety guidelines with stuffing hens or any poultry. 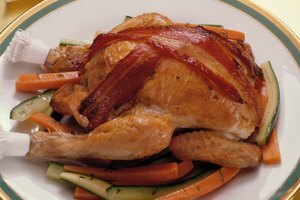 To reduce the chances that bacteria will grow in the stuffing, cook raw meat or shellfish before stuffing, and stuff the birds just before popping them into the oven. Like chicken, Cornish game hens are high in lean protein to build healthy bones, muscles, skin and blood. They also have lots of B vitamins, vitamin E and important minerals like iron, zinc and magnesium. 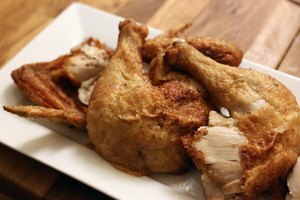 And, according to a study by the Chicken Farmers of Canada, if you cook the hens with the skin on and then remove the skin after cooking, you'll actually reduce the calories even more than when cooking the bird with the skin already removed. The Seattle Times: Cornish Game Hens: Is it Time for a Comeback? 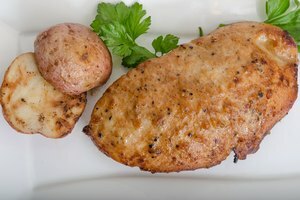 U.S. Department of Agriculture ChooseMyPlate.gov: Why Is it Important to Make Lean or Low-Fat Choices From the Protein Foods Group?